At 41, MMA’s Cindy Hales is back in the cage, but what’s she fighting for? Gold Bar’s Cindy Hales has been out of Mixed Martial Arts for 8 years and she’s reached middle age. But Saturday she’ll be back in the cage battling for a victory — and something more. GOLD BAR — The fighter pops out of bed. It’s 8 a.m. and sunny. The dog is asking to go out. The ducks and chickens have escaped from their coop again. She has to fix that fence. But there will be time for that in a week or so. At age 41, Cindy Hales has a cage fight to win. Yes, she knows this sounds crazy. 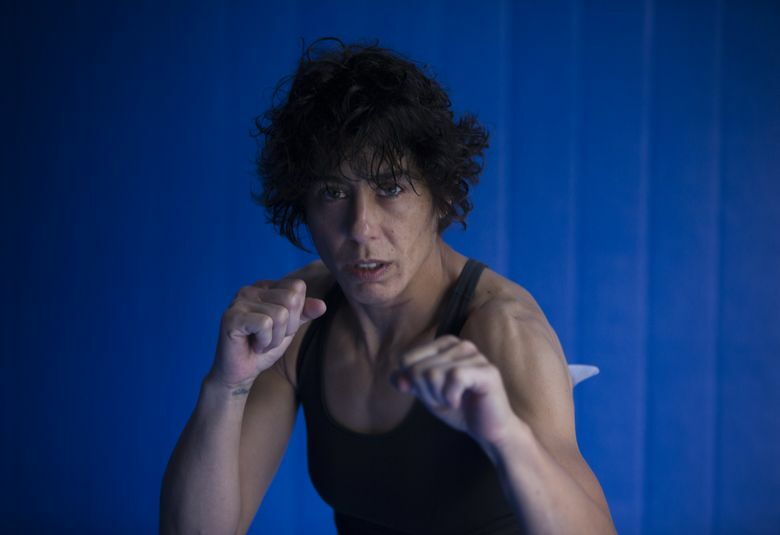 She’s 14 years older than her opponent, Liz “The Titan” Tracy, whom she faces on Saturday in a 125-pound bout at Emerald Queen Casino in Tacoma. Hales, who’s known as “The Sleeper” from years of people underestimating her, hasn’t fought in eight years. She may never have been a bigger sleeper than she is now. Hales sports a mop of curly brown locks that makes people confuse her with a 16-year-old boy and speaks more like a surfer than a middle-aged woman. Despite her looks, she’s in her 40s. So the question remains: Why do it? 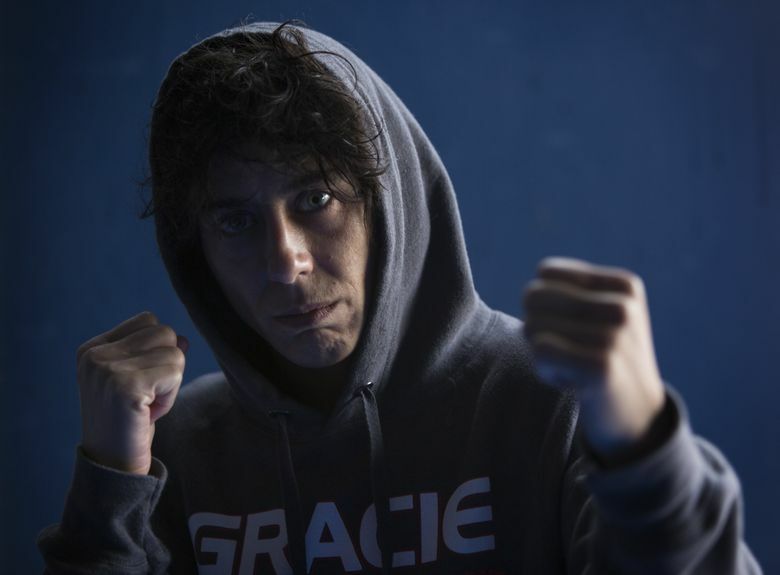 She’s a pioneer in the world of female mixed martial artists, a grappler with a devastating ground game who took just five years to go from white belt to black belt in Brazilian jiu-jitsu — a feat that normally takes 10 years. She won prestigious grappling tournaments and moved on to MMA. She went 2-1 as a pro, her only loss coming to Megumi Fujii, dubbed the Queen of MMA and now recognized as perhaps the best women’s fighter of all time. Hales gave up fighting because of injuries: knee surgery, shoulder surgery, bone spurs, arthritis. Her dad, who has never seen her compete, didn’t like her fighting. But the itch to scrap came back last year. So here we are, hours away from weigh-ins and the fight. Does Hales have it in her? Hales lives alone on her family’s 40 acres off the foothills of the Cascades along the Wallace River. She often takes Maddy, her German Shepherd, for swims, walks and hikes. She used to live on Seattle’s Capitol Hill and drink a lot. There aren’t any bars close now. There’s no crime, no traffic. Most of her 45-minutes-to-an-hour drive to work in Kirkland is on two-lane roads. The drive helps her decompress, to “space out,” to unwind after a 16-hour day of training, teaching and more training. 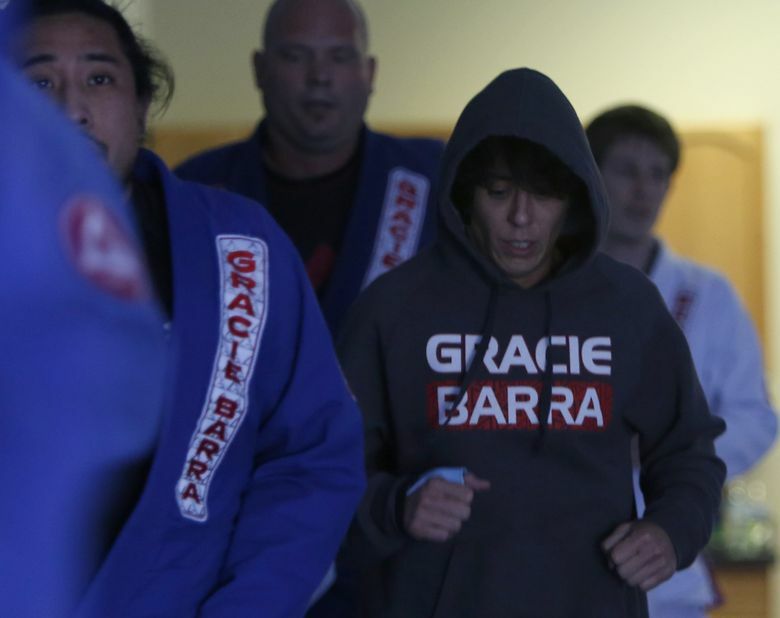 She has time to think — about her fight, about the kids she coaches, about ways to make more money so she can buy the Gracie Barra jiu-jitsu school she teaches at. She sometimes thinks about her dad, Mike, a former nose guard at Arkansas in the 1960s who played alongside Barry Switzer, Jerry Jones and Jimmy Johnson. “He acts like he’s not into what I’m doing now but I think he secretly thinks it’s cool, that I’m a winner,” Hales says. In ninth grade in Arkansas, Hales was a racquetball phenom — she was ranked second in the nation at one point — and would beat all the men in an adult league. When she started showing off, hitting balls behind her back or between her legs, Mike would yell at her for giving up a point. “It stopped being fun,” she said. In jiu-jitsu, a sport she took up in 2001, Hales climbed up the ranks quickly. She was a member of the female “Dirty Dozen,” the first 12 women outside of Brazil to earn a black belt in Brazilian jiu-jitsu. Her inner voice asked: “Am I going to do this forever?” So she quit Starbucks and focused on jiu-jitsu while working random jobs. “I was basically a hobo,” says Hales. That came from her dad, who declined to talk for this story. Cindy fought on, turned her new passion into a career and now runs one of the best grappling programs for children on the West Coast. Saturday, she’ll test herself once more. Hales has quietly been working toward getting back into the fight game for a while. In February 2015, while recovering from her right shoulder surgery, she started one-hand boxing with pro female fighters. “I was just doing it for fun,” says Hales. She began training with Barb Honchak, the titleholder in Invicta FC at 125 pounds who moved to Washington. She caught Honchak with a couple of submissions and Hales’ striking improved quickly. “She is unorthodox but effective, and she hits like a ton of bricks,” says Amy Montenegro, a local fighter. She thinks her dad knows she’s fighting on the card because of Facebook. He hasn’t said a word. Hales hates promoting herself for fights, doesn’t try to reach out to sponsors for money or gear and has no savings account. She’s not in it for fame, either. Her window to earning big fights on a big show, like the Ultimate Fighting Championships or World Series of Fighting, closed a long time ago. She doesn’t care. This time around, she’s more equipped to handle the emotional rollercoaster that comes with fighting. She doesn’t cut weight. She has a job she has to go back to the Monday following her fight. She has Gold Bar, where she can unwind. When Hales fought Fujii in 2008, she cut 25 pounds in six weeks. Her co-workers at Redapt Systems in Kirkland thought she was dying. On the day of the event, she was string-bean thin, 114.5 pounds. She tried to restore fluids with an IV but her veins were collapsing. And she lost by armbar. She still thinks about that fight quite a bit. The Northwest’s MMA community still talks about it and about Cindy’s skills. Now, if she could just get her dad’s attention. Recently, Cindy posted a picture on Mike’s Facebook page, a profile shot of her standing in her fight pose.